This is one of my favourite meals and it’s so quick and easy to make! I usually make extra and then take some to work with me for lunch. The lettuce doesn’t last too long though so I wouldn’t keep it for more than a day. I also just add ingredients by eye, I don’t follow a recipe so you may want more or less or certain things. 1) Heat a frying pan with a little bit of vegetable oil and add the chicken quorn. Turn quorn over once one side is cooked. 2) While the quorn is cooking I prepare the dressing. In a large bowl mix a little bit of olive oil, salt, pepper, little bit of garlic, little bit of freshly grated ginger and a teaspoon of green Thai paste. 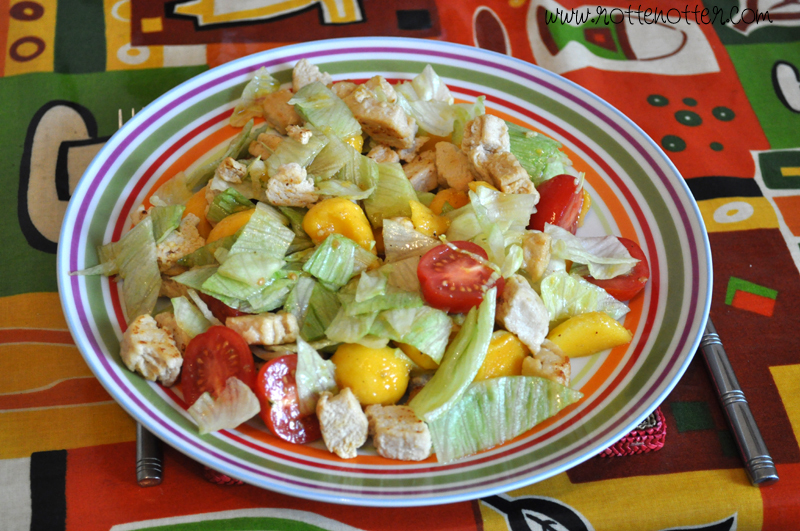 3) Cut the tomatoes in half, lettuce into small pieces and mango. For the mango I use a melon scooper as it just makes it easier to chop up and creates just the right sized pieces. 4) Add the quorn and mix all the ingredients together. 5) Finally eat and enjoy! Such a simple recipe and only takes about 15 minutes to make. Let me know if you give it a try. that looks quite yummy and healthy, i'm such a fussy eater too!